Do NOT spend a penny on appliance repair leads before you see our Unlimited Appliance Leads Generation Machine! 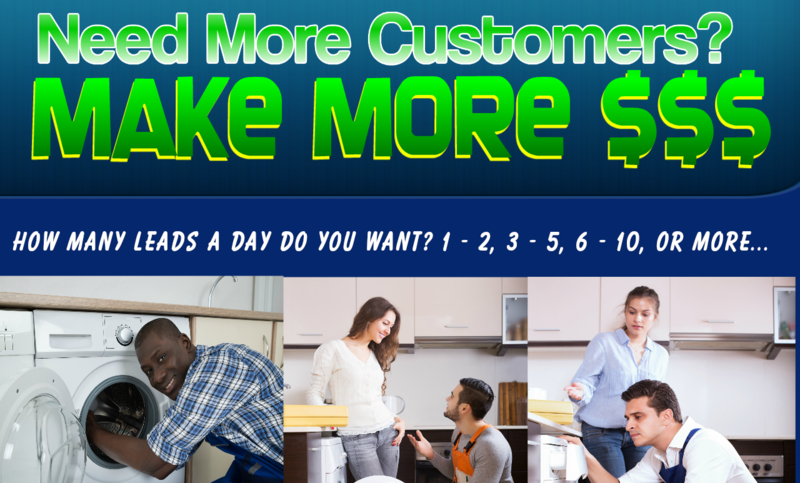 ARMS Lead Generation Machine - The Fastest, Easiest, and Most Affordable Solution To Start Getting As Many Appliance Repair Leads As You Want For A Very Small One-Time Payment - No Contracts, No Pay Per Lead, No Pay Per Click, No Expensive SEO Monthly Contracts, No Nonsense. Best Part: The Appliance Leads Generation Machine is that you get 100% Exclusive Leads - NOT shared leads. That means you don't need to worry about the competition sharing your leads. All the leads you get belong only to you. And yes we teach you how easy it is turn on and off as you like. And that's not all, we show you how to convert them into paying customers. If you’re ready to provide appliance repair service to a lot more customers so you can start to generate more profit from your business, then this is probably the most important tool (ARMS Leads Generator) you will ever need.